KNOXVILLE, Tenn. — No. 20/17 Tennessee (12-5, 1-4 SEC) plays the first of two home “We Back Pat” games, as Arkansas (13-5, 2-2 SEC) comes to Knoxville for a Monday night contest at Thompson-Boling Arena. Tip-off is slated for 7:02 p.m. ET, with the game being carried by the SEC Network and the Lady Vol Radio Network. The match-up with the Razorbacks on Monday will be the first of four straight contests on The Summitt for the Big Orange. No. 1/1 Notre Dame visits on Thursday at 7 p.m. for the second “We Back Pat” game, followed by LSU on Sunday at 1 p.m. for the “Live Pink, Bleed Orange” contest and Florida next Thursday at 7 p.m. The Lady Vols will try to get back on the winning track after dropping their past four contests to Missouri, No. 16/16 Kentucky, Georgia and Alabama. UT was in a back-and-forth affair with Bama on Thursday night before a 3-for-21 fourth-quarter shooting effort by UT and a 9-for-17 performance by the home team gave the Crimson Tide an 86-65 win. Arkansas, meanwhile, has split its SEC contests, falling to No. 7/6 Mississippi State and Missouri, while defeating Ole Miss and Vanderbilt. The Razorbacks, who had Thursday night off, beat the Commodores in Fayetteville last Sunday, 83-62, hitting 13 of 35 three-pointers in that victory. Brenda VanLengen (play-by-play) and LVFL Andraya Carter (analyst) will describe the action for the SEC Network. Fans are encouraged to wear a “We Back Pat” shirt to both games. “We Back Pat” shirts will be available for sale at the Vol Shop. Each shirt contains a special code for a discounted ticket to both UT “We Back Pat” games (Arkansas & Notre Dame). To learn more please visit www.patsummitt.org, like the foundation on facebook.com/webackpat, and follow it on Twitter and Instagram @webackpat. Help us Spark the Summitt during introductions at the game! Download our new free light-up app, courtesy of Coca-Cola. Once downloaded, simply open your Hoops Hype app when the lights go out, and let your phone do the rest. Free parking & shuttle service is available from UT’s Ag Campus. Shuttles begin two hours prior to tip. Tennessee holds a 30-3 all-time record vs. Arkansas, dating back to Feb. 29, 1992, when UT prevailed, 105-59, in the initial meeting. The Lady Vols are 14-1 in Knoxville, 14-2 in Fayetteville and 2-0 at neutral sites. Tennessee is 1-0 in overtime and 2-0 in the postseason vs. UA, meeting for the first time in SEC Tournament play in 2016. UT prevailed, 68-51, in the second round in Jacksonville, Fla., on March 3 of that year. UT is 7-1 vs. the Razorbacks during the Holly Warlick era, including 3-0 at home, 3-1 on the road and 1-0 in SEC Tournament play. She is 1-0 head-to-head vs. Mike Neighbors. All four road games in the series under Warlick have been close, with UT winning by six in 2013 (60-54) and by nine in 2015 (60-51), losing by five (59-64) in 2016 and winning by five (90-85) in 2018. In home games vs. Arkansas during the Warlick era, UT has won by 10 (2014), 18 (2016) and 13 (2017). UT’s only setback to the Razorbacks in Knoxville came at Thompson-Boling Arena on Feb. 23, 2012, when Arkansas walked away with a 72-71 overtime victory and ended an 18-game Lady Vol winning streak in the series. 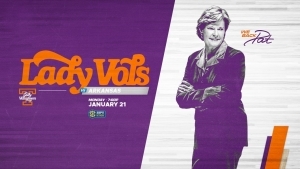 A 75-57 triumph over Arkansas in Knoxville on Feb. 4, 2016, gave Holly Warlick the 100th win of her head coaching career in year number four at Tennessee. Despite the series disparity, Tennessee has overcome some significant deficits to claim some recent wins vs. UA. UT overcame a nine-point second-half gap in Fayetteville on Jan. 11, 2015, to win, 60-51; an eight-point first-half deficit to win 70-60 in Knoxville on Jan. 30, 2014; and an 11-point second-half gap on Feb. 24, 2013, in Fayetteville to win, 60-54. The last time the two teams faced each other as ranked squads was in 2003 when #4-ranked Tennessee won, 92-79, over #12-ranked Arkansas in Fayetteville. No. 1/1 Tennessee and unranked Arkansas met in an NCAA Final Four semifinal game in Kansas City, Mo., on March 27, 1998, and the Lady Vols cruised past the Razorbacks, 86-58, en route to their perfect 39-0 season. WESTBROOK LEADING: Over the past three games, Evina Westbrook has paced Tennessee on offense, averaging 20.7 points, 5.0 rebounds and 4.7 assists while playing 37.0 minutes per contest. She is shooting 47 percent from the field (24-51), 40 percent on threes (4-10) and 77 percent from the free throw line (10-13) during that span. ZAAY STEPPING UP: Freshman guard Zaay Green has stepped up her scoring game in SEC play, ranking as UT’s third-leading point-producer at 10.2 ppg. MEME ALL ABOUT CHARITY: UT senior Meme Jackson has struggled from the field in SEC play, but she has been spot-on from the free throw line. She has hit 15 of 16 attempts for an SEC-leading 93.8%. BOARD TANDEM: Rennia Davis and Cheridene Green are averaging 9.8 and 8.8 rpg. in SEC games, helping UT rank No. 1 in rpg. at 47.4 in five conference contests. LOOKING FOR THE TRIO: In its 12 wins, Rennia Davis (15.6), Meme Jackson (14.7) and Evina Westbrook (14.3) are all averaging double figures in scoring. Zaay Green and Cheridene Green provide 9.3 and 8.3 ppg. In its five losses, Westbrook is averaging 21.4, Zaay Green 11.0, Davis 9.6, Jackson 7.4 and Cheridene Green 7.4. NEW GO-TO PLAYERS: UT’s go-to players are all in new roles and learning to adjust to defenses geared to inhibit them. That can be frustrating. Two sophomores lead the team in scoring (Westbrook, Davis) and freshmen (Green, Burrell) are the fourth and seventh-highest scorers on the team thus far. It bodes well for the future. NO PLACE LIKE HOME: Rennia Davis leads UT in scoring and rebounding in home games this year at 15.6 ppg. and 9.1 rpg. She hits 47% on FGs, 48% on 3FGs and 89% on FTs at Thompson-Boling Arena. Zaay Green recorded her first career double-double and No. 20/17 Tennessee out-rebounded Alabama, 49-44, but it wasn’t enough to overcome a UA team that shot a blistering 50 percent from the floor en route to an 86-65 Tide victory at Coleman Coliseum in Tuscaloosa. Alabama (10-8, 2-3 SEC) was led by junior guard Cierra Johnson, who had 17 points and seven rebounds. Ariyah Copeland finished with 16 points and nine rebounds, while Shaquera Wade added 15 points. The Razorbacks are in the second year of the Mike Neighbors era, and they returned four starters and 10 total letterwinners from a year ago. Guard Malica Monk was UA’s top returnee, averaging 15.9 ppg. and 3.4 rpg. in 2017-18, while point guard Jailyn Mason tallied 11.0 ppg. and 5.6 rpg. Oklahoma transfer Chelsea Dungee leads the team this season in scoring, putting in 16.9 ppg. and knocking down 31 three-pointers thus far. Monk is second at 12.3 ppg. and junior college transfer Alexis Tolefree supplies 11.3 ppg., with 41 three-pointers to her credit. Arkansas was 13-18 overall (3-13 SEC) last season. The Razorbacks’ only key loss was guard Devin Cosper, who averaged 14.1 ppg. and 5.6 rpg. The Razorbacks jumped to a 21-9 lead after one and led by 27 points at the half en route to an 83-62 home victory over Vanderbilt on Sunday. Arkansas put four players in double figures, led by 16 points from Raven Northcross-Baker. Four of her buckets came from beyond the arc. Malica Monk dropped in 15, followed by Kiara Williams with 11 and Chelsea Dungee with 10. Arkansas finished 13 of 35 from three-point range, including 5-of-10 marksmanship in the second period. UA now has 144 threes in 466 tries in 2018-19. UA forced Vandy into 23 turnovers and generated 27 points off those miscues. Rennia Davis recorded a career-high 33 points and 14 rebounds to lead No. 11/11 Tennessee to a 90-85 win at Arkansas on Feb. 8, 2018. Davis connected on 13-of-18 shots from the floor, as the Lady Vols (20-4, 8-3 SEC) earned their 20th victory for the 42nd season in a row. Meme Jackson added 21 points with five 3-pointers, while Jaime Nared netted 16 points, including four clutch free throws in the final 10 seconds to seal the win. Devin Cosper scored 29 points for the Razorbacks (6-18, 2-8 SEC), while Malica Monk went 4-for-4 from beyond the 3-point arc and finished with 25 points. UA cut the deficit to two at multiple points in the fourth quarter, but UT held on down the stretch despite no field goals over the last 3:37. Mercedes Russell posted her 15th double-double of the season in a 59-46 home win over Arkansas on Feb. 19, 2017. After a 2:52 scoring drought by UT to start the first quarter, Russell got things going for the Lady Vols (17-10, 8-6 SEC) by scoring the first five points. She finished the day with 13 points and 10 rebounds, passing Candace Parker for the third most double-doubles by a junior in Tennessee history. Jaime Nared broke out of her recent shooting slump to account for a game-high 19 points behind 3-of-5 shooting from beyond the arc. She added nine rebounds and two steals in the contest despite early foul trouble. Jessica Jackson (18) and Malica Monk (11) led UA. UT steps out of conference play one last time, as it welcomes No. 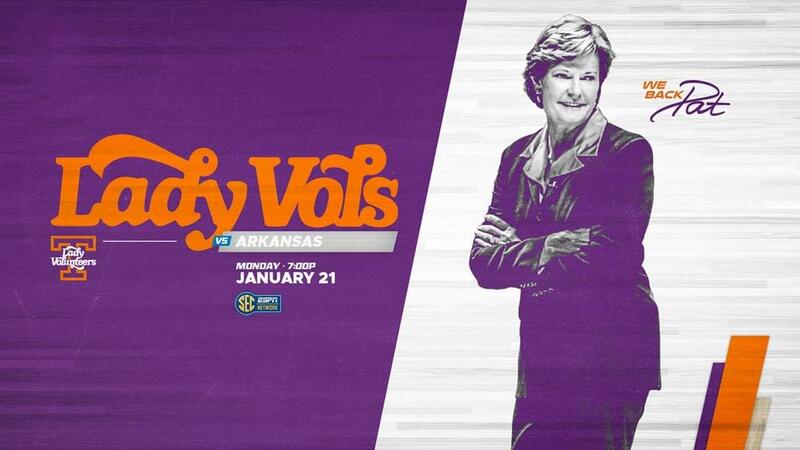 1/1 Notre Dame to The Summitt on Thursday at 7 p.m. (ESPN) for the Lady Vols’ second “We Back Pat” game. Arkansas, meanwhile, is back in Fayetteville on Thursday at 7 p.m. CT, facing Alabama in the Razorbacks’ “We Back Pat” contest (SECN+).